As HP took the spotlight at RAPID 2016 with the introduction of its Multi Jet Fusion (MJF) 3D-printing technology, the printing company plans to once again take the lead at IMTS 2018 with the unveiling of its MetalJet technology. 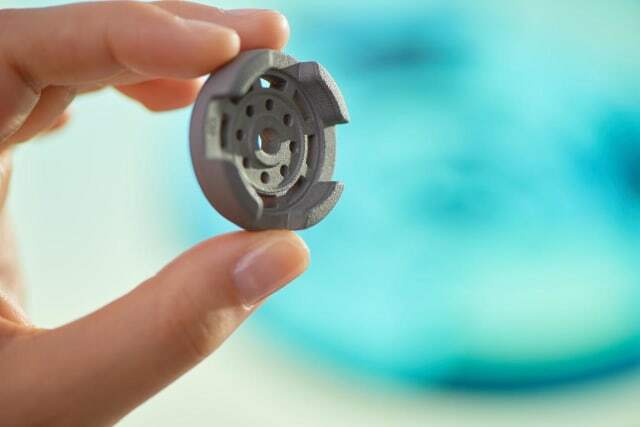 During a virtual press briefing attended by engineering.com, Tim Weber, global head of Metals 3D Printing at HP, discussed the technology in greater detail. Whereas MJF jets a binding ink onto plastic powder, Metal Jet deposits a binder onto metal powders. Unlike MJF, which relies on a set of heating lamps to fuse the material within the printer, Metal Jet parts are green and must be sintered in an industry-standard MIM furnace. If some of this sounds familiar, it may be because a number of companies in the 3D-printing space have developed 3D printers that rely on similar MIM technology and materials. MarkForged and Desktop Metal both produce parts that must be sintered in a furnace upon printing. It is also similar to ExOne’s binder jetting process, which deposits liquid binder onto a bed of metal powder, resulting in green parts that are subsequently sintered. Their technologies differ from HP’s in various ways. What’s most important for the Metal Jet process is its throughput, cost and quality. According to Weber, the Metal Jet process is 50 times more productive than other binder jetting and laser-based systems on the market. Desktop Metal is not compared to with this number because its industrial scale system is not on the market yet. The current build envelope for the Metal Jet system is 430mm x 320mm x 200mm. HP estimates that the system is cost competitive with MIM at runs of 50,000 parts or less. In analysis of two specific components, a golf-ball sized roller finger follower used in vehicle drive trains and a surgical tool for removing tissue, Metal Jet hit the break-even point for 55,000 parts in the case of the former and 65,000 parts for the latter. This could be crucial for manufacturers that traditionally rely on MIM. A MIM part might take three to six months to obtain due to the need to create the necessary tool, test it, modify it and then head to production. In addition to the time and cost element, Metal Jet may be able to produce larger parts than MIM. Whereas MIM relies on a binder like polyethylene, which can make up about 40 percent of the green part, Metal Jet only deposits a small amount of binder. When a traditional MIM part hits the furnace, all of that binder needs to be burned out, which limits the part’s ultimate size. With Metal Jet, HP has been able to achieve parts with wall thicknesses as large as 1in. However, this is just the beginning. Weber doesn’t actually see an upper limit on wall thickness, so the actual maximum part size is yet to be determined. When released—more on that later—the system will likely have a price of $399,000 or less. Parts can be printed with horizontal resolution of 4 to 7 microns and layer thicknesses of 25 to 40 microns. The larger strategy behind the invention of Metal Jet is tackling the $12 trillion manufacturing industry, which can’t be done with MJF and plastics alone. This is, as one might expect, what is driving a number of additive system manufacturers. Weber believes that HP “will win” against its competitors. His reasons were pretty convincing. He added, “We make this PageWide Technology ourselves, so we can provide our own nozzles very cheaply to ourselves.” This point is important because HP is able to add low-cost nozzles to the system to create “4x nozzle redundancy.” If a nozzle is clogged or goes out during a print, this means that the extra nozzles can step in and complete the part without issue. Weber also highlighted the expertise of HP’s inks division, which has seen various unique materials developed, such as those used to jet polymer onto vinyl, glass or cardboard for outdoor signage. This includes those seen with experimental MJF applications, such as jetting conductive inks into plastics. To bring Metal Jet to market, HP is working with two industrial service providers, GKN and Parmatech. GKN is known for its work providing parts for automotive customers. GKN aerospace is already well-versed in metal 3D printing. Parmatech is focused on the medical space. Now, potential Metal Jet customers can go to the HP website and upload a part for metal 3D printing. An applications engineer will then help them with the first steps, including the determination of whether or not the part is even right for 3D printing. Next, engineers from GKN or Parmatech will take over and see the project all the way through from quotation to large-batch production. Weber pointed out that both companies have large industrial clients that may ultimately use Multi Jet as a natural part of the production process, given that the technology is right for a specific project. In the meantime, HP and its partners have established several clients at launch. These include medical customers Johnson & Johnson, Okay Industries and PrimoMedical, which will use the technology for specialized medical applications. Details are forthcoming about exact uses, but Johnson & Johnson has previously disclosed the desire to 3D print patient-specific surgical tools. The advantages of custom implants are already well-known. Other customers include Wilo and Volkswagen (VW). Wilo, a large pump manufacturer, will use Metal Jet to fine tune its pumps and motors for variable fluid dynamics—a form of mass customization at the industrial scale. The relationship with VW has a more detailed road map. Starting now, VW will use Metal Jet to mass customize noncritical metal parts that don’t require crash tests. This might involve something like putting a driver’s name on a plate installed on the car. 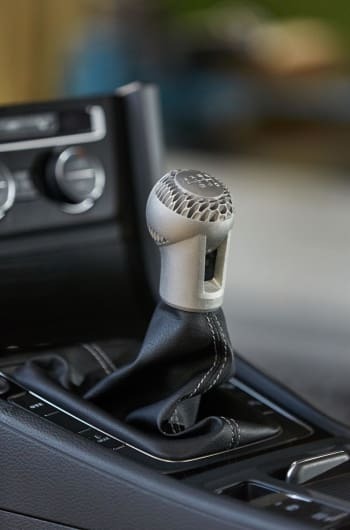 Next year and onward, the company will work on functional production of parts that don’t have to pass crash tests but might have to carry functional loads, such as mass customized gearshifts or mirror mounts. By 2021, VW may explore the use of Metal Jet as it adopts new manufacturing techniques for the company’s new electric vehicle platforms. It’s easy to envision the technology used to lightweight drive chains in order to bring about better fuel efficiency. However, Weber sees Metal Jet’s “killer app” as being used for heat transfer devices, air exchangers and super charger coolers. By 2020, Metal Jet hardware will be released with selected availability. In 2021, HP anticipates general availability of the technology. Until then, we’re sure to see Metal Jet at just about every trade show. We may start to see new customers and partners announced that demonstrate the full capabilities of the technology.